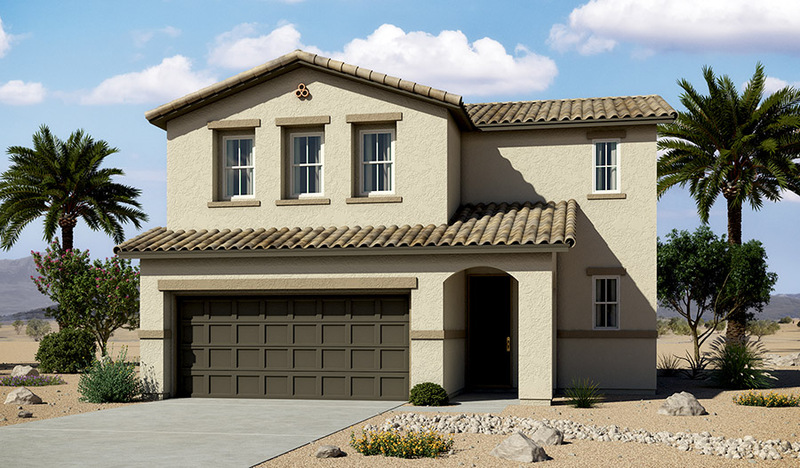 Upscale features and an open layout make this beautiful model home perfect for entertaining. The inviting main floor features a spacious great room that flows into a dining area, with a large kitchen adjacent. There, you'll find a center island, Epicurean stainless-steel appliances—including a French-door refrigerator—quartz countertops with tile backsplashes and maple cabinetry with a modern white finish. The second floor offers a generous master bedroom and attached bathroom, complete with quartz countertops and stainless-steel fixtures. There's also a convenient laundry room with an included washer and dryer, as well as a tech center with an included desk. Other highlights include Mission-style railings, ceramic-tile and wood-laminate flooring, plus a security system.